This release was originally issued today by the U.S. Department of Energy. 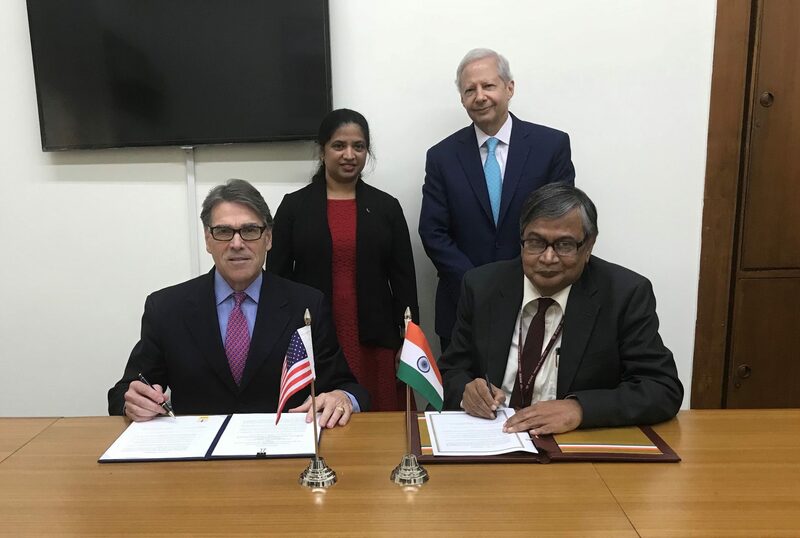 Earlier today, April 16, 2018, U.S. Secretary of Energy Rick Perry and India’s Atomic Energy Secretary Dr. Sekhar Basu signed an agreement in New Delhi to expand the two countries’ collaboration on world-leading science and technology projects. It opens the way for jointly advancing cutting-edge neutrino science projects under way in both countries: the Long-Baseline Neutrino Facility (LBNF) with the international Deep Underground Neutrino Experiment (DUNE) hosted at the U.S. Department of Energy’s Fermilab and the India-based Neutrino Observatory (INO). LBNF/DUNE brings together scientists from around the world to discover the role that tiny particles known as neutrinos play in the universe. More than 1,000 scientists from over 170 institutions in 31 countries work on LBNF/DUNE and celebrated its groundbreaking in July 2017. The project will use Fermilab’s powerful particle accelerators to send the world’s most intense beam of high-energy neutrinos to massive neutrino detectors that will explore their interactions with matter. INO scientists will observe neutrinos that are produced in Earth’s atmosphere to answer questions about the properties of these elusive particles. Scientists from more than 20 institutions are working on INO. Scientists from the United States and India have a long history of scientific collaboration, including the discovery of the top quark at Fermilab. This DOE-DAE agreement builds on the two countries’ existing collaboration on particle accelerator technologies. In 2013, DOE and DAE signed an agreement authorizing the joint development and construction of particle accelerator components in preparation for projects at Fermilab and in India. This collaborative work includes the training of Indian scientists in the United States and India’s development and prototyping of components for upgrades to Fermilab’s particle accelerator complex for LBNF/DUNE. The upgrades, known as the Proton Improvement Plan-II (PIP-II), include the construction of a 600-foot-long superconducting linear accelerator at Fermilab. It will be the first ever particle accelerator built in the United States with significant contributions from international partners, including also the UK and Italy. Scientists from four institutions in India – BARC in Mumbai, IUAC in New Delhi, RRCAT in Indore and VECC in Kolkata – are contributing to the design and construction of magnets and superconducting particle accelerator components for PIP-II at Fermilab and the next generation of particle accelerators in India. Under the new agreement signed today, U.S. and Indian institutions will expand this productive collaboration to include neutrino research projects. The LBNF/DUNE project will use the upgraded Fermilab particle accelerator complex to send the world’s most powerful neutrino beam 800 miles (1,300 kilometers) through the earth to a massive neutrino detector located at Sanford Underground Research Facility in South Dakota. This detector will use almost 70,000 tons of liquid argon to detect neutrinos and will be located about a mile (1.5 kilometers) underground; an additional detector will measure the neutrino beam at Fermilab as it leaves the accelerator complex. Prototype neutrino detectors already are under construction at the European research center CERN, another partner in LBNF/DUNE. INO will use a different technology — known as an iron calorimeter — to record information about neutrinos and antineutrinos generated by cosmic rays hitting Earth’s atmosphere. Its detector will feature what could be the world’s biggest magnet, allowing INO to be the first experiment able to distinguish signals produced by atmospheric neutrinos and antineutrinos. The DOE-DAE agreement enables U.S. and Indian scientists to collaborate on the development and construction of these different types of neutrino detectors. More than a dozen Indian institutions are involved in the collaboration on neutrino research. To learn more about LBNF/DUNE, visit www.fnal.gov/dunemedia. More information about PIP-II is available at pip2.fnal.gov.